Invitations for upcoming events are distribued. Apple has just sent invitations to the press organisationsa and representatives to join them on September 9 for an upcoming event. The rumors have revealed this date already, so it is not a surprise today, but it is clear now that new model of iPhone will be announced on this date. This time people are hoping that the company will announce two variants of iPhone 6 with regard to screen size. No sooner had this report excited of Apple fans everywhere (including those owning an iDevice), than a new report started spreading on Friday morning. Coming out of China, the new dispatch says that Apple will be introducing the 4.7 inch Apple iPhone 6 on September 9th, along with an 8GB model of the Apple iPhone 5S, and nothing else. That means that no phablet and no wearable device will be unveiled. The current speculation calls for the rumored 5.5 inch iPhone phablet to be introduced before the end of the year. The Apple iWatch introduction might still be delayed until 2015. But remember that these are all assumptions. 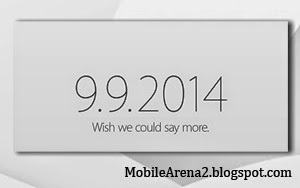 Apple sent out invitations for the September 9th event, which will take place at 10am Pacific Time. It will be September 10 at 10pm according to Pakistani Time. On the bottom of the invitation, Apple writes, "Wish we could say more," which could be a hint about the larger sized screen expected on the iPhone 6. It could also be a wearable device with which apple might enter in a new era of its inventions. The main question remains, just what will Apple be revealing along with that model on September 9th? Let's See and wait !! !